Cats are notoriously associated with a very strong dislike for water, which may lead us to believe that they can care for all of their grooming needs on their own, but that’s a MYTH! Sometimes cats need baths, too! As we all know, cats come in all shapes and sizes and with different personalities and conditions that may require us to help them stay clean and healthy. For instance, some kitties are a little on the “fluffy” side and may need help getting to that hard to reach spot. Some furry felines might enjoy digging in your favorite potted plants or find themselves covered in the spaghetti they were sharing with your kiddos. Some kitties even suffer from food allergies or other skin conditions diagnosed by your vet and need assistance with maintaining healthy skin and a soft, glorious coat via regular bathing. So, should you, or your kitty, ever find yourselves in a position where you need to give kitty a bath we’ve compiled a little tutorial on how to proceed both gently and safely to keep the situation as stress free as possible for both of you! Gather all of your bathing supplies and organize them so that they’re within easy reach! You’ll need somewhere to bathe your kitty (a large, plastic basin, a deep sink or bathtub), a non-slip floor mat, a mild cat/kitten shampoo (*It’s very important to use shampoo specifically formulated for cats because it’s pH balanced and will not irritate their delicate skin), a small cup and a of couple towels. Give your kitty a thorough brushing to help remove any loose fur, knots or mats. Place the non-slip mat in the bottom of your basin and fill it with 6-8” of warm water. There should be just enough water so kitty can still stand firmly on all fours. Slowly lower kitty into the water, offering lots of praise and affection. Kitty may not like it, but they will also feed off of your energy. So, try to remain calm and reassuring. You can have a second person help out and even offer some yummy food treats as a distraction, if needed. IMPORTANT: If at this point kitty is *NOT* having it and is very fearful or attempting to bite or scratch, then stop. Pushing a kitty that is overly scared will serve no purpose; instead it will be traumatizing and could lead to one or both of you being injured. For situations like these we encourage cat owners to seek the assistance of a professional groomer that is good with nervous cats. Use the cup to slowly and gently pour water on the kitty’s body. You may choose to just wet the contaminated area or to give your kitty a full body bath. If you are doing a full body bath be sure you avoid the head altogether. Your kitty will appreciate you keeping their ears and face dry and opting for more of a sponge bath with a clean (no shampoo), damp cloth in these areas. Apply a small amount of shampoo to your palm and lather well between your hands before applying it to your cat’s coat. Massage the shampoo into kitty’s fur focusing most of your energy on the trouble area(s). Use the cup again to thoroughly rinse the soap from kitty’s fur. It’s really important that kitty is rinsed very well because as persnickety as they are with their coats they will be sure to lick off any excess soap left behind, which could make them sick. Drain the tub or basin and allow kitty to shake off! The hard part is over – CONGRATS!! However, Kitty will still be pretty wet after only shaking off so, make use of those towels and continue to dry your wet friend off as much as possible. Your freshly bathed kitty will remain slightly damp even after your best efforts to towel dry and at this point, it’s best to leave them in a warm room to finish drying off naturally. If Kitty is part of a multi-cat household it’s a good idea to keep the freshly bathed kitty separate from the others until s/he is both calm and fully dry. 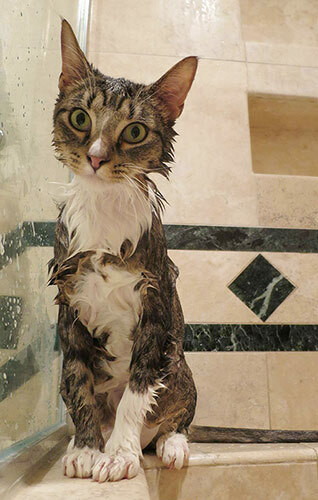 Bathing your kitty, although necessary, temporarily changes their scent, which can sometimes lead to conflict. After kitty is all dry and everyone is calm, the scents can be redistributed by rubbing all of the kitties with the same (dry) towel or blanket and reintroducing them.